If you visit Kilbeggan Distillery museum, you will get to clamber about a largely intact 19th-century distillery. There is a working waterwheel connected to driveshafts and belts; a steam engine backup for the waterwheel; fermenting vats; a large cast-iron mash tun; some huge pot stills; and three sets of millstones that ground up the malt. 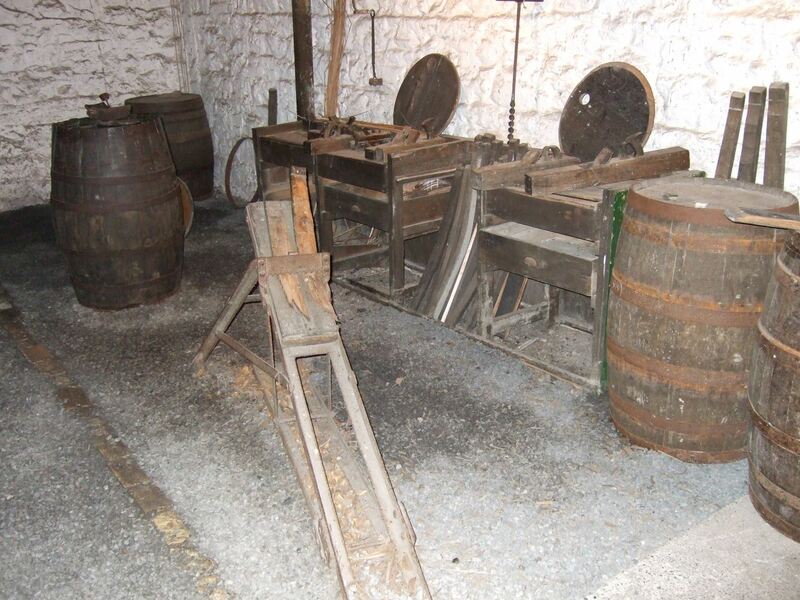 None of this old kit is used in the service of whiskey-making today but there is an active distillery on the same site that looks surprisingly similar in many respects. I took that photo last week, but there is little, if anything, in that scene that helps date it to within a century. Or, indeed, a millennium. Cooley's full-time cooper, John Neilly, is old-school. There's a table saw for making a straight cut, but there aren't many straight cuts in a cask so, for the most part, he shapes and coerces the wood with hand tools. These are the traditional tools of the cooper, the same my grandfather, and his father, would have known and used. John very kindly offered to show me (and my folks) some of the skills and processes involved in a trade that died out in my family - and Ireland - long before I had a chance to appreciate it. 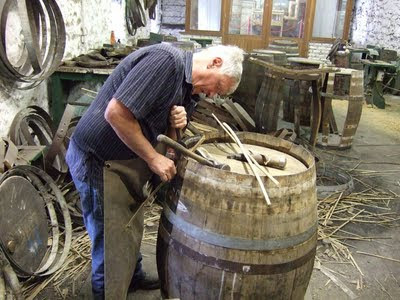 When we arrived, John was repairing an ex-bourbon cask that had perhaps slipped off a pallet and struck the ground hard along one edge. 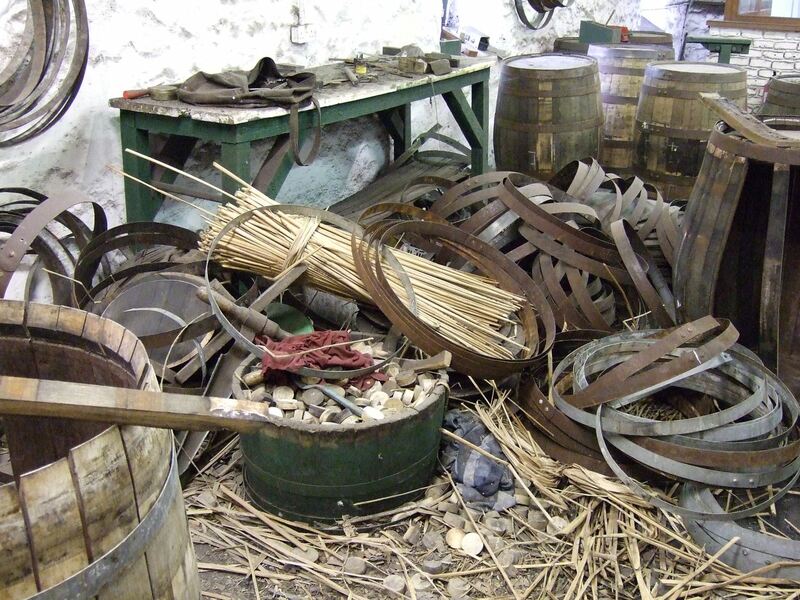 Half-a-dozen or more of the staves had cracked so John had removed the iron hoops holding the cask together and was swapping in fresh staves from a sacrificial cask. These weren't quite the same length so he squared them off first before fitting. 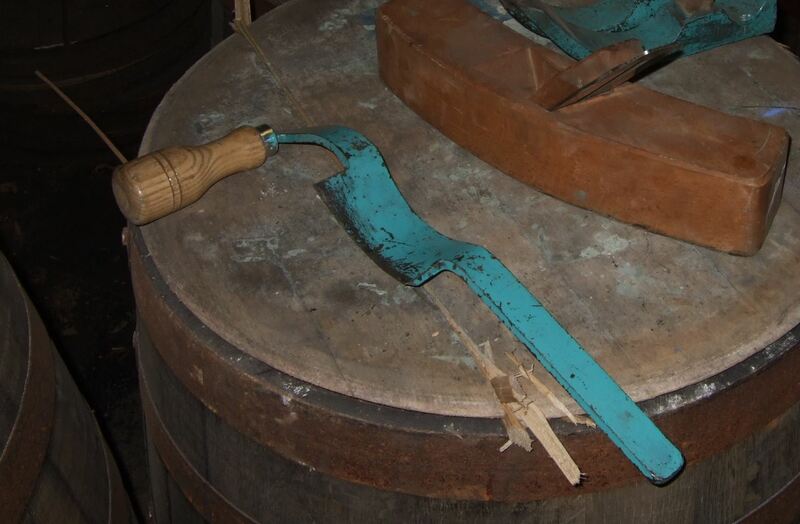 Some quick work with an adze restored the tapered stave endings, while a crumb knife shaved a neat, smooth curve to the inner surface of the cask. The croze added the notch that the cask end would sit snugly into. John invited me to try my hand at each of these. The wood yielded like butter under the adze and crumb knife but the croze has a knack to it that escaped me. I hope I didn't chip away any useful parts of the cask! 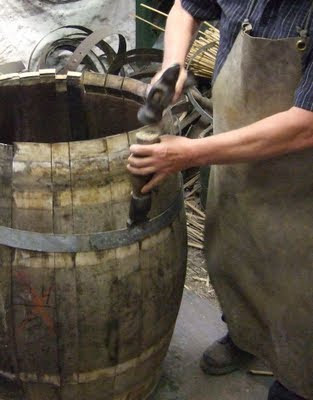 Something new to me was the use of dried rushes to seal the joins in the cask. 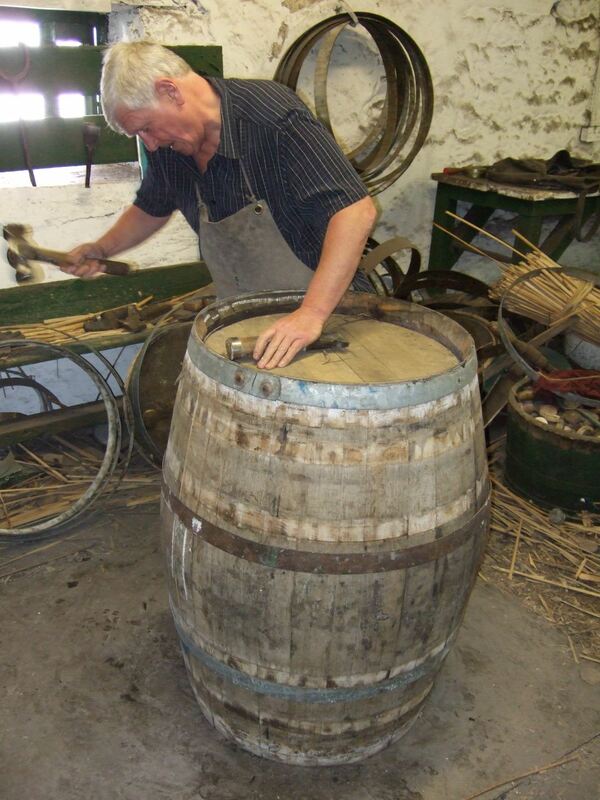 John inspected the reconstructed cask, judging where there might be a risk of a leak. He then forced apart the staves at this point and inserted a rush. Apparently the Americans use beeswax for sealing, but rushes do the job in Scotland and Ireland. Also a little unexpected was a spot of metal-bashing right there in the workshop. The iron hoops loosen over time so John often removes the rivets holding them together and taps in a couple of new ones. I had never seen a rivet being driven. It looks like tough work. I never imagined it was easy but I did think rivets went in hot, semi-molten, and somewhat malleable. Not here though; they were cold. There is more hammering to drive the hoops on tightly, and to persuade the staves to lie flush. In Kilbeggan, John works alone but he has also toiled in cooperages of up to 30 men. The racket must have been immense! While we were there, John regaled us with lots of stories from his almost 45 years of coopering. 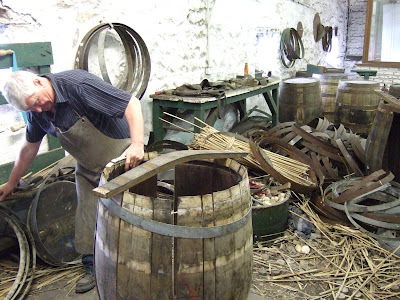 When he started, in Scotland, a cooper in a distillery would kick off the day with a dram. No half-measures either, but a generous pour. More was had at regular intervals throughout the day. The labour was so intense, there was no chance to feel any effects from this, and drunkenness was certainly not tolerated. Coopers were paid by the cask so productivity was very high and men would literally run to fetch new material to work on. It sounds like a tough trade, but a very satisfying one to master. Whiskey would be nothing without its time in cask. The interaction between spirit and wood is a kind of alchemy, and Cooley is very fortunate to have a master cooper who can not only repair a cask but can create new types of cask to stretch the raw spirit in creative directions. Alex Chasko, the Innovation Manager at Cooley, hopes to lay his hands on some fresh Irish oak, for example, which John will craft into brand new casks. 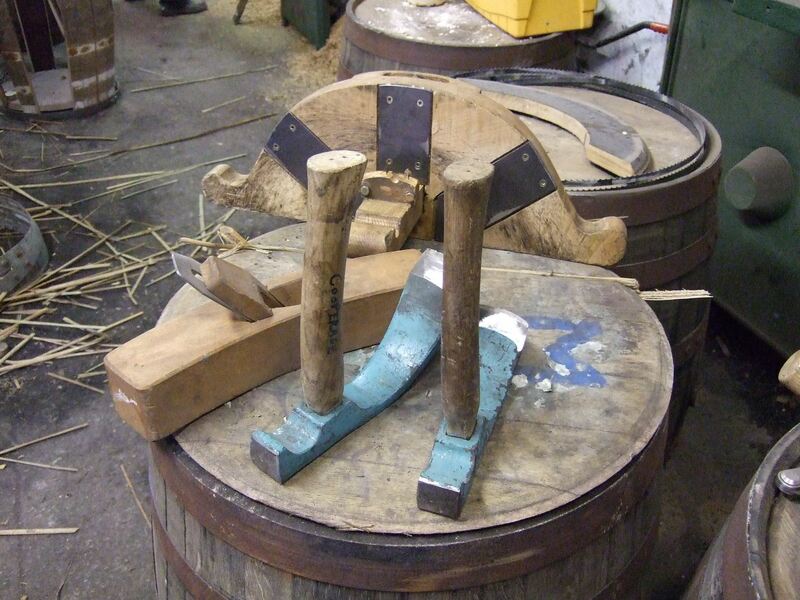 We are used to the influence of pre-seasoned American and European oak on our whiskey but what will Irish oak do? Nobody knows, but thanks to John's mastery of an ancient craft handed down over countless generations, we will find out. I'd like to thank John Neilly for giving very generously of his time and knowledge, and Bernadette and Brian Quinn of Kilbeggan Distillery for allowing us the behind-the-scenes access. We came away with a new appreciation for the remarkable, fascinating and ever-changing operation at Kilbeggan.